Frequently Asked Questions. Do you have a question that isn’t answered here? Please let us know! ↪ ︎When will the conference take place? Where is it located? The 2018 JSCamp Conference will take place on July 18-19, 2019 at the AXA Auditorium in Barcelona. ↪ Is this conference for me? ↪ Which language is spoken? All sessions are held in English. We encourage all participants to speak English, even with your friends, to make everyone welcome and join conversations. ↪ How long are the talks? Regular talks are 30 minutes and lighting talks are 5 minutes. ↪ Will there be wifi onsite? ↪ Will there be disabled access? JSCamp is pleased to offer an accessible Venue for wheelchair users. There are complementary tickets in case you need assistance. For further information on how to get to the venue, please visit the how to get to JSCamp section. ↪ Do I need to wear my badge during the entirety of the conference? To gain entry to JSCamp events, on the day of the event attendee must present the ticket sent by email, printed out in an easily legible form. All attendees, sponsors, volunteers and the JSCamp team are obliged to wear the badge in such a way as to prevent any misuse and for security reasons. ↪ Can I sponsor JSCamp Barcelona? ↪ My question is not listed here. Whom do I contact? ↪ What is included in the ticket prices? You'll have access to all the JSCamp conference sessions on the dates included in your ticket. The pre-conference workshops, all require separate tickets. All tickets include breakfast and permanent coffee and soft drinks bar during the conference. Not included in the ticket price are accommodation, travel, lunch, dinners, or any other costs, unless specifically indicated. ↪ Is there a group discount? Absolutely! You will get automatically 10% off when buying more than three tickets! ↪ Why do I have to pay VAT? ↪ Can I get a refund? ↪ Are there student tickets? We do not offer student tickets or discounts, but you can still apply for a scholarship, open until 1st June. ↪ Are there any scholarships? Yes! If you’ve always wanted to attend JSCamp Barcelona, but have difficulty attending the conference this is your chance! The Scholarship Program is open until 1st June. We hope our program enables you to join us and contribute to our conversation. 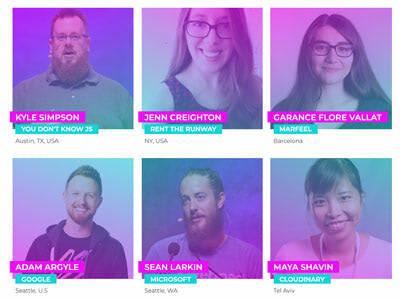 A conference like JSCamp represents an opportunity for people from all over the tech community to come together and explore the challenges faced by developers worldwide. Since we do not offer lunch at the conference itself, you have to take care of yourself like the other attendees. ↪ How can I support the Diversity Program?